Back in 1996 I was elected to my first of 5 General Conferences of the United Methodist Church. Since then I’ve been on some very effective teams and some that weren’t. I was on the former General Council on Ministries for 4 years, The Connectional Table for 8 years, The Worldwide UMC Study Committee for 4 years, and now on the General Commission on Religion and Race for a four-year term. I’ve been on plenty of other teams in the global UMC including mission teams, pastoral teams, and am now in my eighth year of a Cabinet team. I also like to think of the Columbia District as a team. That’s been our motto: “Together We Can Do More!” and it has happened. I clearly remember the use of “team” back in 1996 as our Episcopal nominee, Ted Walter, gave his speech before the gathered delegates of the Southeastern Jurisdiction as we met in Denver, CO at General Conference. Sometimes when I get optic rectosis, which is a nice way of saying I’ve been looking at life from a position a lot lower than a pat on the back, it helps to know the truth of 2 passages of Scripture that have a lot in common: I Corinthians 10:13 and I Peter 5:9-11. They have a lot in common, especially that God delivers and that we’re never alone when we think we’re the only one in the world going through this mess. What I hear is that I’m not the only one who has ever been through this crud. There are plenty of other sojourners who walk a similar path, and in both passages we have a God who is faithful and strong and on our side! Now that’s a team! “Team” is a simple word to describe the Trinitarian theology that I appreciate so much, although I’m a little taken aback at the words I’ve heard lately at the conclusion of prayers: “In the name of the Father, the Son, and the Holy Spirit.” Didn’t Jesus say to pray in his name? What’s with this? Maybe I’m late to the game, but it’s no big deal, really. After all when you see one person of the Trinity, you see all three at work in that marvelous dance, distinct but indivisible, when Holy Perichoresis takes place. “Perichoresis” is a word composed of two roots: peri which means around, and choresis from whence we get our word, to dance. In other words, God is always dancing around as a team, as the Trinity – always on the move, on the go, and at the ready – together! Better news for us is that when we feel alone facing life’s problems we should remember that we bear the Imago dei, the Image of God. Therefore, if God exists and works in the community that we call the Trinity how much more so should we lean upon one another when times are tough? We are vital members of a divine-human team that always wins! Why do you think that “ER” was so popular on TV from 1994-2009, or “Bones” now? One reason is that emergencies or crisis management, require not solo players but team play, and we are enthralled and galvanized by the way in which a motivated team can take on a challenge. It’s not white knights, lone wolves or highflying eagles that solve crises. It’s team play. Can I dare say it’s the Trinity and the church! As I write this our appointment-making cabinet is on lunch break, and I thought it might be a good time to write a few reflections. This effort tends to affect your desire to eat anyway. For me, it either makes me want to endlessly get up and graze at our snack table, or makes my appetite utterly disappear. I’m not too hungry today. Those whose lives depend upon what we do here, don’t let my lack of appetite freak you out. Things are going extremely well as we ponder the best match of pastoral gifts and graces and church needs. I appreciate so much Bishop Jonathan Holston, South Carolina’s new bishop. He is a keen observer of people and has already made significant relationships across our annual conference that informs this process. He is transparent, fair, and impresses upon the cabinet that the missional aspect of our appointments should always be foremost in our shared thinking. We follow Wesley’s rules of “Do no harm. Do Good. Stay in love with God.” We are very careful to avoid harming churches and clergy (including their families). We sincerely want to do good for all involved. We especially want to honor and stay in love with God for whom this kingdom-building enterprise exists. This is hard work, exhausting work. We use every bit of information that we can muster identifying church needs and clergy gifts and family contexts. We pore over statistical data that churches supply along with their self-identified opportunities and points of concern. We try to look for laser-like clarity as we study the consultation information and profiles of clergy. We kill a lot of trees with putting together all this information about churches and pastors, plus we have all sorts of electronic information that we project on the screen in the room. It’s an arduous process and we need your prayers. The clergy and families along with the churches need plenty of prayer, too. We are a sent-system of clergy deployment. Ministers are called by God when they enter United Methodist ministry and are sent from then on. Churches don’t call pastors, and preachers don’t self-select their places of service. We try to make for good matches so that Jesus is glorified and God’s grace is more effectively shared. I have even pondered if we might spread the Word better if we moved all of our church members and left the clergy where they are. That would be missional! I can remember the times in my ministry when I have really wondered about the wisdom or apparent lack thereof behind appointment-making. Everyone in United Methodist itinerant ministry and all the churches who have been receiving pastors over the years have been burned more than a few times. We have probably all wondered, “Did the District Superintendent listen to us?” After seven years as a DS I know that the answer is “Yes!” Sometimes that listening doesn’t provide an answer that’s either expected or desired. My experience on the Cabinet is that we try our very best to be faithful to this ministry for the good of all and for the glory of God. A lot of you, clergy and SPRC Chairs, are going to get expected and unexpected phone calls at the end of the week. Please know that you are appreciated, prayed for, and loved. Let’s all continue to bathe this process in prayer. Every day we have appointments to keep. As United Methodists this takes on special meaning during this time of year. What does God want you to do today? As we make appointments, my prayer is that we all keep our God-appointments today. May our walk with God empower all of lives to be fruitful wherever we’re sent today! Addendum: I just grazed at the snack table and was sifting through the mini-candy bars and felt something unusual. It was a Baby Ruth all sealed up with nothing but air inside. All kinds of thoughts and sermon uses have popped into my head, plus some thoughts about some of our churches and clergy and appointment-making. Before you take offense, no, of course, I’m not talking about you! Nevertheless, what sermon titles or appointment thoughts pop into your mind? “All Dressed up, but nothing inside,” “Nice Wrapper…,” “All Show and No Dough,” “Looks Good on the outside, Empty on the inside,” …. lots of possibilities come to mind. Tell me your thoughts as it pertains to the church! Congress is off-limits! Going to seminary in Boston was wonderful. Living on the North Shore was exhilarating with its historic towns of Salem, Rockport, Gloucester, Ipswich, Marblehead and Swampscott. The sea air wisped throughout the campus. The ocean froze in the winter with floes left behind as the tide went up and down. The seafood was superb! Boston proper was utopia. Cambridge and Harvard Square were Mecca’s for free thought and expression. The place exuded intelligence in an unobtrusive air. Boston’s sites were so historic and more than quaint: Old North Church, Bunker Hill, the U.S.S. Constitution; Fenway Park; Copley Square; Paul Revere’s home; Park Street Church, Filene’s Bargain Basement, “Cheers,” and Quincy Market located next to Faneuil Hall: the cradle of liberty and the Boston Tea Party. Cindy and I will never forget staying in the home of members of the Boston Pops. Part of what makes the Fourth of July so special to us is listening to the Pops play Aaron Copland’s “Fanfare for the Common Man” and Tchaikovsky’s “1812 Overture.” “Pops Goes the Fourth” on PBS isn’t to be missed! However, with all of New England’s patriotic fervor and sites I am reminded that the bulk of the Revolution’s cost was borne by Southerners. New England gave the American Revolution its philosophical underpinnings and treatises while Southerners fought most of its battles with South Carolina having had more Revolutionary battles than any other state. Think about the movie “The Patriot” to catch glimpses of King’s Mountain, Cowpens, Charleston, Camden, and Buford’s Massacre. Thank God for backwoodsmen and Over-the-Mountain Boys in addition to the Swamp Foxes of the Lowcountry. July Fourth is a holiday that should rouse the weakest spirit. It is the triumph of the farmers and shopkeepers, the little people, over the high and mighty ranks of Redcoats. It is indeed “Fanfare for the Common Man” including women the likes of Betsy Ross and Molly Pitcher, African-Americans like Crispus Attucks the first martyr of the Revolution, and American Indian tribes doing their part, too. What makes America so special is our common humanity. We don’t relish elitism. We are all here because we escaped somewhere else, except for the Native Americans, and African-Americans brought here against their will. If we will but remember our shared pain, travails, and triumphs, America will yet be a beacon of hope to humanity. All this makes me think of the little church that I’ve been passing on a regular basis. It’s located on I-77 near Winnsboro, SC. The church’s sign is a bit out of the ordinary. The name of the church is “New Independent Methodist Church.” The logo, however, is the Southern Baptist symbol which is pretty appropriate, actually. Southern Baptist churches have by-laws each unto themselves in their congregational polity. This is much too independent for my liking. As I think about Independence Day 2012 and ponder our life together as United Methodists, there’s no such thing as an independent Methodist church. We’re all connected and I’m glad! We’re a dependent denomination. We depend on God and each other! That’s a good reminder for America, too. Indeed, as I think about who we are as Americans and United Methodists, I’m drawn to the fact that our history is a multi-colored and multi-cultured tapestry. We’re meant to be a melting pot of diversity not a salad bowl with lettuce, then cucumbers, tomatoes, etc. topped by whatever dressing in a top-down hierarchy. Our political system shouldn’t be about who’s in office or has the majority. We’re in this thing together and better not forget it! American democracy and United Methodist connectionalism work best when they’re horizontal not vertical. What we hold in common trumps special interests any day. As for me this Fourth of July, I’m going to celebrate it as American Dependence Day. We need each other. Together we can do more! Happy Fourth! Think dependence more than indepedence! It’s Annual Conference time for most of us. Ministers are moving and churches are receiving new clergypersons. It’s a time fraught with anxiety. Clergy ask, “Will my children like the new place? Will my spouse find a good job? Will my call be fulfilled here or squelched?” Churches wonder such things, too. Will they like their new pastor, how many changes will there be in the order of service, and will the sermons and pastoral care be good? It’s a scary time in an itinerant system. However, John Wesley said, “Itinerancy was the apostolic plan for evangelization.” He thought literal movement of preachers helped Methodism stay a vital spiritual movement. Here’s the current rub: We expect elders to itinerate and whole families to pick up and move, but now we’re not going to promise a place to serve. At first glance this doesn’t seem fair, but we are all concerned about denominational decline and wonder if higher accountability will increase clergy and church fruitfulness. Tongue-in-cheek, it has struck me that we might have a better chance at revival if we left the preachers where they are and moved all the people. Just a thought, ha! Regardless, General Conference 2012’s action to delete “guaranteed appointments” has made our whole system more anxious. My prediction is that the Judicial Council will rule the legislation unconstitutional because it allows each Annual Conference to be the arbiter of what the word “Ineffective” or “Effective” means. That strikes me as an abrogation of the GC’s authority “over all matters distinctively connectional… and to define the powers and duties of elders” (Par. 16, 2008 BOD). Sure, the Annual Conference is constitutionally the “fundamental” (Par. 11) and “basic” (Par. 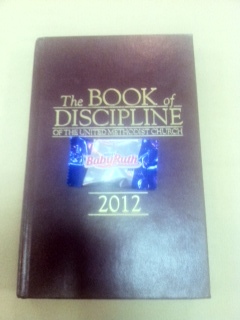 33) body of the United Methodist Church, but the Annual Conference cannot subtract from the basic ministerial credentialing standards of the Book of Discipline: BOD Par. 304.5 and Judicial Decision 536 (www.umc.org). It seems to me that each Annual Conference’s interpretation and definition of “Ineffectiveness” or “Effectiveness” allows the Annual Conference to trump the powers reserved to the General Conference and lessen common standards of effectiveness. Don’t get me wrong – I’m all for clergy excellence and an easier way to deal with clergy deemed unappointable, but I also remember being on the sexuality subcommittee at the 1996 General Conference where we had to define what “self-avowed practicing homosexual” meant. Committees on Investigation in Annual Conferences could not make their own interpretation or verify complaints until the GC defined the actual meaning of the phrase. We’re in a similar situation here. In a connectional church with transfers of clergy from here to yon, there needs be one definition of “Ineffectiveness” or “Effectiveness.” I wonder if that’s even possible given the subjectivity involved. As a District Superintendent I have to ponder the objectivity or subjectivity of negative letters and phone calls on a daily basis and respond accordingly. It’s no small task! Ministry is no small task! It’s a high calling to be in ministry. We have the extraordinary blessing of being incarnational with people in their most significant life events. Of course there’s the challenge of being on call 24/7, but I have heard very few complaints from clergy who are sincerely answering God’s call. One issue, however, that I have heard about is housing. Most of our clergy still live in church-provided parsonages. The parsonage system for United Methodist clergy is intended to facilitate the movement of ministers from church to church without being encumbered by the distractions of buying, selling, or owning a house. It’s a fine system unless you have no clue where you’re going to live when you retire. Ministry is a strange life. It’s a wonderful life. After living in parsonages for 32 years, teaching United Methodist polity for a decade at Candler, and a DS for the last 6, I have found myself evaluating our way of being church. We are an Episcopal (Episkopos is Greek for “Bishop”) system of government tempered by conferences. In other words, we have Bishops that appoint ministers to their various fields of service, yet it is General Conference that authorizes Bishops for the task. Annual Conference Boards of Ordained Ministry recommend persons to be licensed, commissioned, or ordained and the Clergy Session votes approval or not, then the Bishop acts. Both have to be in concert with one another. We conference all the way up from the local Charge Conference, District Conference, Annual Conference, Jurisdictional Conference, to global church at General Conference. Then we receive and accept the clergy appointments made by the episcopacy. At the most local level, the 11-person Staff-Parish Relations Committee, once a year, advises the Bishop as to whether or not they think it’s time for a new clergyperson to come to their church, and once a year, pastors state whether or not they want to move. Notice this is all advisory. The church may have its desires and agenda, but it’s also only advisory. Also note that clergy don’t get to say whether or not they’re willing to move. Willingness to move was assumed for me when I was ordained elder 32 years ago. I dare say that the same is pretty much true for anyone called to be a deacon or a local pastor. It’s part and parcel of being in ministry. Therefore, we take our appointments, yours and mine, “without reserve,” as our Book of Discipline puts it (Par. 333.1). We are a “sent” system, not a “call” system. Our system offers a means by which clergy and churches are matched and ministry is enhanced. If either the clergy or the congregation has any reservations or veto power then the whole system breaks down. So a lot of faith is necessary in this enterprise, not to mention, a lot of leadership and discipleship.